Many women find themselves taking along too many clothes on their travels but for whatever reason can’t seem to limit their selections while they are packing. To get the most wear out of what you pack, limit yourself to a capsule wardrobe when you travel. 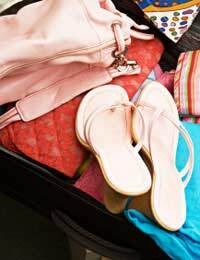 Follow a few simple packing tips such as packing clothing in coordinating colours, packing only three pairs of shoes, packing a range of accessories and packing dressy outerwear only and you’ll be sure to be well dressed without taking along your entire wardrobe. It used to be said that a woman’s capsule wardrobe was built on clothes in neutral colours, but in truth as long as the colours coordinate a woman’s capsule wardrobe can encompass any hues. When women travel they should select just one colour palette, whether it be earth tones, jewel tones or even ocean tones, and make sure that all of their clothing conforms to these shades. This means that no matter what a woman grabs from her suitcase it will match something else and even with limited clothing options she will be able to create many new different outfits. Travelling certainly does open up a wide range of social situations but this does not mean that women will have the luxury, or need the luxury, of their entire wardrobe. Three pairs of shoes is generally all women need for most tourist trips. One pair of casual shoes (which are known to be good for walking), one pair of dressy shoes and one pair of flip-flops for water areas and showers will suffice for generic travelling situations. However, if you are travelling for a particular reason and need a specific outfit then of course bringing the corresponding shoes is important. Similarly, if you are travelling for an athletic trip or for skiing then bringing necessary equipment, including shoes, is imperative. Accessories such as hats, scarves and jewellery are some of the lightest and easiest items that women can pack. Accessories can also make the same clothes look radically different, so packing a range of accessories will help you get the most out of limiting clothing options. However, do not bring any jewellery or other accessories that are extremely valuable, hold personal meaning or cannot be replaced. Safety standards tend to be more lax while you travel than when you are at home and flashy or memorable accessories might attract the attention of pick-pockets and thieves. Unless you are travelling for an athletic reason or to go skiing then bringing dressy outerwear will help you look appropriate for any situation. Outerwear is bulky and can be heavy, so limiting yourself to only one option will leave space in your luggage for other things. As it is better to be overdressed than underdressed, bringing dressy outerwear will allow you to create a good impression despite the situation. A capsule wardrobe is important for female travellers who have limited luggage space. Packing clothing in coordinating colours, limiting their options to three pairs of shoes, bringing a range of accessories and wearing only dressy outerwear are all ways in which a capsule wardrobe can help women travellers travel light on luggage but heavy on style.